Today is Fastnacht Day in Pennsylvania. We also call it donut day. There's a bit of a controversy here this year as the local newspaper asked for healthier recipes for Fastnachts and the older women railed against it~a must read at mcall.com. Mcall.com has stated they are having technical problems getting today's edition up and running so I'll get back to you on it! These are traditionally cooked in lard, which many of the old-timers still do. 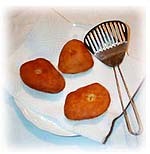 Makes about 20 to 24 Fastnachts, depending on size. Scald the milk. In a large mixing bowl, combine the scalded milk with the mashed potatoes. Add 1/2 cup sugar plus the margarine. Mix with an electric mixer. If the mixture is still warm, cool to about room temperature before proceeding with next step. Dissolve the yeast and 1/2 teaspoon sugar in barely warm water. Add to the potato mixture and mix well. Add 2 cups flour and mix again. Cover with a towel and let rise for 25 minutes. Add the salt and beaten egg to the mixture. Add 4-1/2 cups flour, stirring it into the mixture with a large spoon. Turn onto a well floured board and knead for about 3 to 5 minutes. Add a small amount of extra flour if necessary so the dough can be handled without sticking to your fingers. Grease a large bowl. Place the dough in the greased bowl. Cover with a thin towel, and let rise in a warm, draft free place for about 2 hours or until it is at least double in size. On a lightly floured surface, roll the dough 3/4" thick. You can use a doughnut cutter to cut the dough or cut as typical Fastnachts - Cut the dough into 3" to 4" wide strips, then cut the strips into 3" to 4" pieces. To allow the center of Fastnacht to fry completely, cut a small slit in the center of each piece, using a sharp paring knife. Arrange the pieces of dough, about 1-1/2" to 2" apart, on large wax paper lined trays. Cover each tray with a thin towel. Place the trays in a warm place for 45 minutes to an hour, or until the dough pieces have raised to about double in size. Heat the shortening to 365º. Deep fry until both sides are golden brown, turning one time. Drain on white paper towels. Cool completely before serving. Store in a covered, airtight container. This recipe can be doubled with no change in preparation directions. To use this raised doughnut recipe, for glazed doughnuts: Beat together: 2-1/2 cups confectioners' sugar, 4 tablespoons margarine and 1 teaspoon vanilla. Add enough milk to make a thin glaze. Drizzle the glaze over the slightly warm doughnuts or dip the doughnuts in the glaze. Shake slightly warm doughnuts in a bag with confectioners' sugar, or a combination of confectioners' sugar and cinnamon. The title of this post, should anyone need to know, is the proper, and most common Mardi Gras parade chant. This is the official Mardi Gras site, full of information and history. Very interesting if you have the time to look. 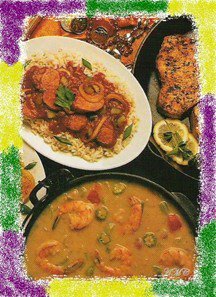 I've already thrown out a couple recipes suitable for Mardi Gras, Gumbo and Cajun BBQ Shrimp. 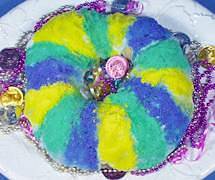 Here are a few more and a link to the recipe for the Mardi Gras classic~King Cake. Cut chicken and slice sausage. Chop onion and green pepper. allow to heat. Can be cooked on high for 3-4 hours instead. baby throws the next Mardi-Gras party (or bakes the next King Cake). feel free to use whatever you want there. Cook in the subject line and include your name or blog address for me to share. Also, the three ingredients listed must be prominent in the dish you submit. She sent over 3 boxes that have thousands of recipes in them. 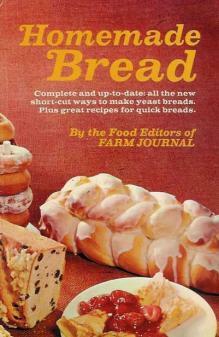 There were several books and cookbooklets (which I added to my list) and clippings and hand-written recipes galore. I am in HEAVEN. Some of them are so old that I will need to find a way to copy and preserve them, some are newer. It seems that mom didn't just clip recipes that interested her but clipped almost every recipe from every box and magazine she has ever had in her possession. The funniest part is that she had already weeded through all of these recipes before she passed them to me! Well foodies, tomorrow is a three-fold food-fun day; Mardi Gras, Fastnacht Day and Ready, Set, Cook day! I have a lot of writing to do and one sick child (so far, crossing fingers here). PLEASE tune in tomorrow for the fun~until then, thanks for being so patient with my lack of posting. There's no denying it, fish is good for you. Most fish contain polyunsaturated fat, Omega 3 fatty acids, are low in cholesterol, low in sodium and the current USDA recommendation is to consume fish at least twice weekly. but what if you're a first-timer in the seafood arena? Denser fish are easier to cook, in general. Fish like cod, halibut, salmon, tuna, and swordfish are all easy to handle and leave a little room for error. Steaming or poaching fish is not only the healthier choice but the easiest one. minutes. Squeeze a lemon wedge over the fish and serve. sides over medium-high heat. Squeeze a lemon wedge over the fish and serve. wedge over the fish and serve. once if desired, for approximately 5-7 minutes per side. Here is a link to HGTV about purchasing and cooking fish at home. 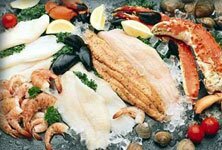 And please follow this link before you buy fish, it's important information about the dangers of mercury in seafood. On to the good part; RECIPES! to pouring consistency; set aside. Brush seasoning paste over entire fish. about 10 to 12 minutes. and serve with lime wedges and garnishes. slices in bottom of baking dish. Drizzle with half the oil. Sprinkle with half the thyme. Season with salt and pepper. Arrange fish in single layer over onions, cutting fillets as necessary to fit. Layer tomatoes,then zucchini over the fish. until lightly golden. Stir in parsley and salt and pepper to taste. Sprinkle lemon slices with bread-crumb mixture. and puree. Add creme fraiche and mustard and process until blended. least 30 minutes or up to 1 day. liking (7 to 10 minutes). Serve immediately. non-stick pan spray. Arrange the fish on the broiler pan. about 6 minutes, or until the fish flakes easily with a fork. oregano, salt, and pepper. Set aside. In another pie pan or dish, combine the egg and buttermilk. crumb mixture to coat both sides with crumbs. If you type "Cooking with Anne" into a google or other web search, you will find that I am not at the top of the list. Sad. At any rate, this is ahead of me and rightfully so; Cooking With Anne, the cartoon. I actually wrote to Mr. Bittner to tell him I thought the similarity in names was "comical" (no pun intended) and he was gracious enough to write back, he really is a nice guy. The cartoon is a sort of post-apocalyptic look at cooking. This link starts you at the end, hit the drop down box below and start at the beginning. Very different and definitely worth a look! I'll be back soon, sorry we missed out on Ready Set Cook yesterday. Potatoes have gotten a bad rap lately. It's no wonder, with all the no-carb/lo-carb diets that are going on, the potato has been shunned. I urge you to take a second look. These little spuds are not so bad for you after all. Peru in 1536 though, the potato took off for Europe and Sir Walter Raleigh was the first to introduce the potato to Ireland in 1589. That is the VERY short history of the potato in America but, you get the idea. you can find more than the usual white variety at almost any supermarket. and contain no fat or cholesterol. Potassium is a mineral that is in every cell in the body. Potassium has been shown to reduce the risk of high blood pressure and stroke. A deficiency in the mineral can make a person feel weak or fatigued. Vitamin C is an antioxidant that neutralizes pollutants in the body, helps to prevent cell damage and produces the collagen which makes healthy cartilage, joints, skin and blood vessels. Iron is a mineral that is essential for an energetic body, a sharp mind and a strong immune system. Iron helps blood and muscles supply oxygen to the body. A diet rich in iron can prevent anemia which can cause ulcers and stomach or colon cancer." When I was pregnant with my second child my one craving was baby red potatoes. No salt, no butter, no nothing; just boiled or steamed. They were so good and still are my favorite potato. I'm not advocating hashbrowns for breakfast, vichyssoise for lunch and a baked potato for dinner (though wouldn't that be lovely?) but a potato dish or two a week won't hurt anyone. The best diet always has been and always will be, variety and moderation. Kind of like life. Just in case you're drawing a blank~here are some potato recipes. Combine mayo, dill, onion powder, and anchovy. Mix well. pieces, Let sit twenty minutes. Add to boiling potatoes. drain potatoes and dumplings.Pour sauce over and serve. being careful not to use too much oil. Serve with applesauce, or sour cream. I made potato pancakes last night but I add garlic, nutmeg, and Parmesan cheese. 1) Preheat the oven to 400 F. Bake the potatoes in the oven for 1 hour. Remove, leaving the oven on and let cool until easy to handle. 3) Arrange the potato skins flesh side up on an ungreased baking sheet. melted into soup. Taste, and add salt if needed. designed to be a hodgepodge of things leftover. frozen mixed vegetables, some peas, some corn, whatever. right on the skillet if you have an ovenproof skillet. and cooks. Don't get confused and put ice cream on it. That was her little joke." Called Dad yesterday and he is gaining on life one day at a time. Keep him in your prayers! Here's one to tide you over and a teeny hint; one of the ingredients here is in the post I am currently working on. Yes, this is BAD for you, but man, it's so good, who cares? 1. Cook lasagna noodles al dente, drain well and line the bottom of a well greased 9x13 pan. 2. 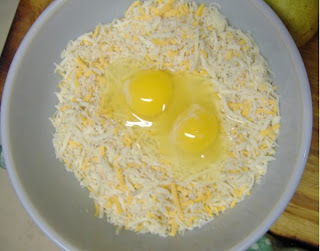 In a large bowl mix mashed potatoes, cheese, egg, and seasonings spread half over noodles. 3. Cover with another layer of noodles and mashed potatoes. End with a layer of noodles. 4. Melt butter or margarine in a small frying pan. Sauté onion until clear and soft. Pour over noodles. Top with extra cheese if desired. 5. Cover with foil. Bake 30 minutes in 350 degree F oven. **This was the last thing I read to my Grandma from her very favorite book, the Bible. She had been trying to memorize it for quite some time and we thought it appropriate to read to her as she was passing over. I don't have a whole lot of time to blather on about Valentine's Day today so I'll just post what we'll be having tomorrow. I know, how unromantic! Mommyhood comes first though and today is a delay due to snow and that sort of cuts out my usual blogging time. C'est la vie! No Ready, Set, Cook tomorrow since most of you will be out to dinner or cooking something pre-planned. Tune in next week for our usual game. Whatever you do, kiss your love (or think of them if you can't do that) and have a wonderful day! Mix all spices, garlic and onion together. Rub all over chicken and place in a sealed plastic bag and refrigerate overnight or for at least 8 hours. Remove chicken from bag and roast, covered, at 350° for 1 hour. I serve this whole at the table and we shred it and serve it on freshly made whole wheat tortillas and top with a sauce like Hoisin or ginger/soy. Red Baby Bliss potatoes, steamed or roasted with herbs and minced garlic. We like rosemary and thyme. Whole green beans steamed with lemon and sea salt. Mix all well and chill. Mound in a pretty dish and let sit at room temperature until soft enough to spread. You can add a salad if you wish but I think this is enough considering dessert WILL be served on Valentine's Day! My very favorite chocolate dessert is this one. It's pretty much a flourless chocolate cake except for the baking time, which is what makes it so mousse-like. Allow to cool for 20-30 min. Add chocolate to egg mixture and blend until smooth. Fold egg whites into chocolate/egg yolk mixture. Pour into a greased 8-inch springform pan and bake 425 degrees F for 14 min. This will be soft in the center when it comes out of the oven, but will set up as it cools. When done correctly the center is nearly like fudge and the edges are slightly dry. Dust with powdered sugar or set a dry clean doily (or other piece of open-work) on top of torte and sprinkle with powdered sugar. Remove by pulling straight up. The design left behind is a very pretty effect! My copy is ©1969 and the jacket has it selling for $4.50 then. The link I found has it listed for $24.50 now! Some of the wording is a little funny for today but the recipes are still great. I have a copy like this since the '60's. Hope your family will love some of these recipes as mine did. My copy too, is stained! Lots of use! favorites as well as 'you children'. Most farm women keep a few cans of salmon and tuna on hand in their cupboards. But not many have discovered teaming the fish with thin pancakes to make exciting, hearty main dishes. When taste-testers voted on Midwest Fish-stuffed Crêpes, made by a recipe contributed by a Kansas rancher's wife, they described it with one word-excellent. You'll want to try this recipe. It produces a substantial fish dish that meat-and-potatoes farmers praise. That's a tribute to its tastiness. Combine salmon, tuna, water chestnuts and celery in a bowl. Cook onion in butter until soft (do not brown). Blend in flour, salt and pepper. Slowly add milk, stirring constantly, until mixture comes to a boil. Remove from heat and stir 2 tblsp. cheese and lemon juice into sauce. Stir 1 c. sauce into salmon-tuna mixture. Put a generous spoonful of mixture on center of each crêpe. Roll up; place seam side down on oven-proof platter, or in a 13x9x2" pan. Spread remaining sauce over crêpes. Sprinkle with remaining 4 tblsp. cheese. Bake in a moderate oven (350°) about 30 minutes. Serve hot. Makes 8 servings. Beat milk into well-beaten eggs. Sift together flour, sugar and salt into milk mixture. Beat with rotary beater or electric mixer until batter is smooth. Pour about 2 tblsp. batter into a lightly buttered 8" skillet, preheated over medium heat. Begin at once to rotate the pan to spread the batter evenly over the bottom. Turn once; bake until light golden brown on both sides. Repeat, buttering skillet for each baking. Makes 16 crêpes. Last night's dinner was spaghetti. Boring, right? Well, that depends on who makes it! I am not a fan of my own marinara but a few in the house won't eat any other spaghetti sauce. If you have perused my family recipes this will be a repeat for you. It's based on the recipe I learned in school, adapted for my family's tastes. The bacon and ham hock sound odd unless you are Italian. 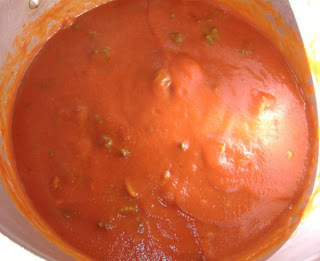 Almost all Italian "gravy" is made with meat in it, even if it's taken out before serving. Saute bacon in a large pot until limp but not browned. Add vegetables and sauté until onions are translucent. Add stock to deglaze the pan. 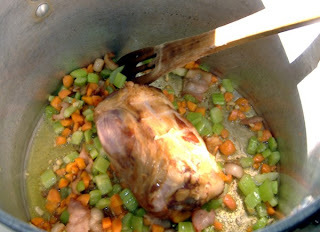 Add ham hock and simmer briefly. Add tomatoes and all seasonings except bay leaf. Simmer 2 1/2 hours DO NOT LID or it will become acidic. pureé through a food mill or process and strain. Reheat and serve as desired. This is what my kids really like about spaghetti nights. This isn't your everyday run-of-the-mill cheese bread. 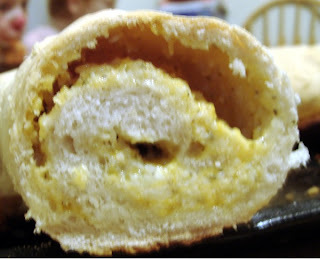 There's a tunnel of savory cheese right through the center of this bread. It's excellent with spaghetti and is so hearty it can be eaten all alone. Add yeast to water and dissolve. Add sugar and about 1 c flour and mix well. Let this stand in a warm area until it "sponges" or puffs up. Add salt and remaining flour, a cup at a time, until the dough forms a ball. Knead until smooth and elastic about 6-8 minutes. 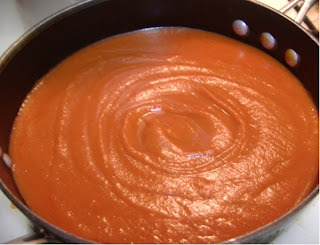 Cover with a tablespoon of oil and turn to coat. 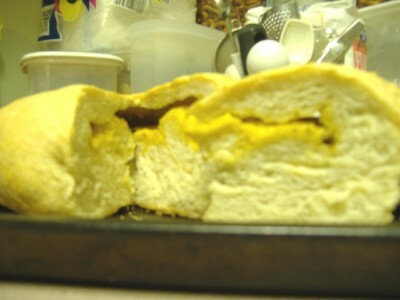 Let rise, covered, in a warm area until doubled in size, about 1 to 1/2 hours or less if you use rapid rise yeast. Mix this all together well. When dough has risen double, punch down and separate into 2 parts. I do the forming in one of 3 ways. 1) Roll dough into a rectangle about 12 x 15 inches and spread half of the filling down the center. Fold up short ends and roll from long side and pinch closed. Bake on a lightly greased cookie sheet. 2) Roll dough into a circle, about 12 inches in diameter. Spread half the filling to within an inch of the edge and fold over towards center, keeping the circular shape. Turn over and bake on a lightly greased cookie sheet. 3) Shape as above (circle) and place in a lightly greased round casserole or souffle dish and bake as directed. Once the dough is shaped, set it to rise for a second time, until double in bulk, before baking. Bake at 400° for 30 minutes. Reduce heat to 350° and bake for an additional 15 minutes. Let cool for at least half an hour or the cheese will drip right out when you cut it! This is shaped like #1 above. This is almost a meal in itself, really, It makes 2 loaves and when we have pasta with it we usually only have one wedge each and save the other loaf for another time. Each loaf makes 8 wedges or slices. P.S. Dad is HOME. Please keep praying for him! Recipes in from our game! You guys are so much fun and I vote that someday we hold a real live Ready Set Cook so we can all meet and eat until we bust! Or, I can stop by everyone's home for dinner since you're all so talented. Take half pound of boneless pork chops and cut into small pieces..sautee in pan on meduim heat with a splash of olive oil. After meat is cooked slice up zucchini in small slices, add small peices of fresh broccoli, mushrooms, bamboo shoots, and green onion. Throw in pan with olive oil and satuee till soft but not limp. Take sliced ginger and grate it into sauteed veggies. When its all cooked and ready to eat, serve over brown rice with a splash of soy sauce. Heat 1 Tbsp oil in non-stick skillet. Saute pork and ginger in skillet. Add zucchini and apples when pork is about half-cooked. Saute all till apples and zucchini are tender and pork is thoroughly cooked. Cover and keep warm. Cook ramen noodles according to pkg directions. Drain noodles, then add flavoring packet and mix. Toss noodles with pork mixture and serve. Preheat oven to 350 degrees Fahrenheit. Combine flour, pepper and seasoning salt in a shallow dish and dredge pork chops, coating completely. Heat a skillet with the oil and brown pork chops. Remove and place chops in a casserole dish. Set skillet heat to med-high and add garlice, ginger and onion rings. Saute until onions are translucent. Add zucchini and mushrooms. Saute until med-soft. Pour soy sauce over, reduce heat and let simmer for about five minutes. Add stock to pork chops and then pour zucchini mixture over. Bake in oven until pork chops are cooked through and no longer pink in the middle. Remove from oven and sprinkle cheddar cheese evenly over. Cover with lid or aluminum foil until cheese is melted and serve with rice. Like the trooper she is, K submitted a recipe anyway with the eggplant that she mistakenly bought. Good stuff! In small bowl pour ¼ cup soy sauce, sprinkle of Slap Yo Mama and juice of ½ lemon. Add 2 slices of ginger, finely chopped up. Lightly pepper pork chops and place in zip lock bag. Add soy mixture, seal and place in fridge for ½ an hour. While the chops are soaking, peel and cut up egg plant into small cubes. Place in pan of salted water and cook till tender. While egg plant is cooking, in medium bowl grate ¼ cup parmesan cheese, add pepper, salt and a sprinkle of Slap Yo Mama Hot seasoning to taste. Chop up ½ an onion and one clove garlic. Cook in olive oil till tender. Cool. Drain egg plant and wring out with dish towel, place in fridge to cool. Take chops out of the fridge and remove any ginger pieces stuck to it. Dredge in bread crumbs, eggs wash, and then back in bread crumbs. Brown in olive oil, place on cookie sheet and bake for 45 minutes (or till done) in 350 oven. Take cooled egg plant and onion and add to cheese. Add an egg, juice of half a lemon and and ½ blood orange, mix. Add enough bread crumbs to hold together. Put back in fridge until chops are almost done- about 15 minutes prior to completion. Roll egg plant mixture into balls and flatten into patties. Cook in vegetable oil till brown on both sides. Place in oven to keep warm. Bring your asparagus up to a boil and cook till desired tenderness. Take off heat and drain. Add kosher salt, butter and the juice of ½ lemon. Put back on low heat till butter and lemon combine. For anyone new, Tuesday is "Ready, Set, Cook!" day here. Just like the show (can anyone tell me if it's still on?) I present my readers with 3 ingredients and their job is to come up with a dish using them. Oh yes, by the way, I am NOT the one who comes up with these~blame my kids, if you can after looking at those adorable faces. 1) Dream up a dish using the 3 ingredients prominently, your virtual pantry is unlimited (that means you can use anything else you like but you cannot "lose" the original ingredients in the recipe). You DO NOT have to have these on hand or make the dish for real to play! 2) Post the name of your dish in the comments section FIRST. at irishones7 *at* juno *dot* com with Ready, Set, Cook in the subject line. I post recipes on Wednesday along with your name and/or blog address. I think we already know that I'm not one of the cool kids, and I aim to fully entrench myself in my culinary un-coolness with this post. Everyone has favorite tools in their kitchen, things they couldn't do without, and I am no different. I have noticed lately though that many people have hugely expensive and state-of-the-art gadgets in their kitchens. I don't. I don't even own a microwave. I did until this last move but we never got around to replacing it, and I seldom miss it. First, on the bottom is my cutting board. Yes, it is a BOARD, not plastic or synthetic in any way. 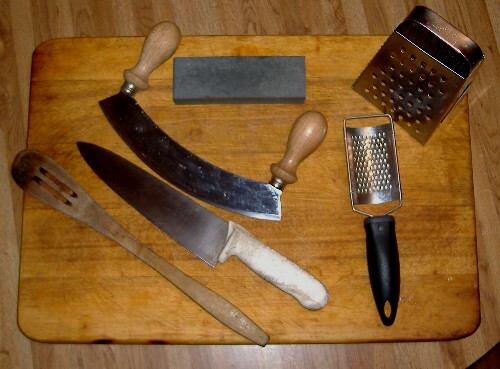 I have vivid and icky memories of the cutting boards we used in school. They were white plastic and if they were not dried properly and then stacked together, they reeked. It was gross. Not much else to say there. I love wood for cutting - it cleans easily, is kind to my knife and looks good -rustic, if you will. On to what is on the board; on the very left is my treasured wooden spoon. Unlike others, it is very thick and sturdy, has slits in it to make stirring many things easier, and it doubles as a disciplinary tool if the need arises. Next up is my chef's knife. Yep, that is a genuine, bona fide Dexter Russell Sani Safe knife. For anyone who knows what I'm talking about, stifle your laughter and pay attention. That blade is pure carbon, nothing else sharpens quite like it. The blade is full tang and thin, and even though the hilt is plastic, it's a firm grip and its lack of weight makes it useful for many, many things. I do love the feel of a Sabatier, and I have even had the money to purchase one guilt-free before, but I love this knife and can't see ever spending more than is necessary on anything. My mezzaluna was one of those things I just had to have. It's great for chopping herbs into tiny pieces without shredding yourself in the process. Above the mezzaluna is my oil stone - the one I use to sharpen my beloved chef's knife. Yep, I sharpen my own tools. Why pay for someone else to do it? I can get my knives razor sharp with a minimum of damage and even correct some damage with my own stone. This is one of those priceless items. A box grater? I don't have a food processor either and anything grated in this house comes by way of this tool. Another thing I wouldn't be without even if I did have a processor. The last piece is another grater. I use this one for grating whole nutmeg. I almost never use nutmeg that comes from a container. I love the smell and taste of freshly grated nutmeg and this very fine holed baby does the job perfectly. I also use it to grate cloves of garlic when I am in a real hurry and don't have time to mince it with my knife. My other favorites are my paring knife, my large and extra large stainless steel mixing bowls, my Calphalon pans, my cast iron pans, Grandma's rolling pin, my HUGE stockpot and the large ceramic bowl my mom brought home from Amish country. And my hands - best "gadget" I have. I own a coffee maker, a blender, a toaster, a waffle maker, a coffee grinder and a Crockpot. I don't feel the need for anything fancier but there are some things I do covet. I want a croquembouche mold. Not for any reason other than the fact that it's an odd piece of equipment. Nobody really NEEDS one, you can stack a croquembouche all by yourself, but I want one anyway because they are so obscure. I want a Kitchenaid mixer. A red one. I don't think that needs an explanation. I want a mortar and pestle to replace the heavy stone one that I somehow lost. I'd prefer an olivewood one but I can't be that picky. I want a couscousier ... because they look neat. By the way, we WILL be playing Ready, Set, Cook! tomorrow so, heads up everyone~be prepared! Jam Handy has recently opened the coolest online all-things-retro store, Seul Boy. Get on over there and browse (and buy!) he has the neatest collection of cards among other things-you just have to see for yourself. When you're done with that, read his blog. If you're into retro recipes at all, this is the blog for you! NEXT...this is not so new but, if you have a baby, or know someone who is having a baby, go visit Sugarbearz. My friend has the cutest bunch of stuff for sale-hoof it on over and check her out too. OK, I am done with the shameless and gratuitous plugs for the day, promise. Super Bowl XL is being played this year in Detroit Michigan's Ford Field between the Seattle Seahawks and the Pittsburgh Steelers. While I have always been a fan of the Steelers and a football fan in general, I haven't seen a Super Bowl in ages. We don't have tv here (beyond PBS, that is) so we won't be watching this year either unless we impose our large-ish family upon someone else's couch. At any rate, if I were hosting a Super Bowl party I would most likely go easy. Appetizers would be the main focus with possibly something more substantial at half-time. One of our favorites for this type of party is chili served in bags of corn chips. A single-serving bag of corn chips, turned on it's side and opened to form a pouch is the perfect spot to rest a ladle full of chili, with or without beans. Top it with shredded cheese, sour cream and some chopped green onion and you have a delicious totable snack. Standard fare is so ... standard, but if that's what people will eat, I say go for it. There is nothing wrong with the old standby chips and dip, buffalo wings, potato skins and pizza. Most parties will have a beer choice and while I don't drink I will hook you up with a local microbrewery just down the street, Bethlehem Brew Works. I can attest to the fact that the food is awesome, and plentiful; we always take a leftover box home. I picked a few recipes here that are different than the usual spread for Super Bowl Sunday and a couple are lower carb in variety for those of you who are eating that way. This first one is for the Seattle fans. of springform pan-9x3. Bake 375 for 8 min. until golden brown. blended. Spoon over crust. Bake 45-50 min, or until center is set. onions and caviar or red pepper. Serve with crackers. For the Pittsburgh fans the Primanti Bros. famous sandwich The one with cole slaw and french fries right inside it (this is NOT one of the low carb recipes) and you can see a photo at their website. You can come up with your own of course with cappicola, a good French baguette or other heavy bread, cole slaw and french fries. Drain spinach well, and squeeze out excess moisture. Set aside. Melt butter in a frying pan over medium-high heat and add onions and mushrooms. Bake in a 325° oven for 35 minutes or until set when lightly touched in center. temperature. If made ahead and refrigerated, reheat in a 325° oven for 15 minutes. reserve marinade for another use or discard. Chop all artichokes and set aside. Heat marinade over medium heat; add onion and garlic and cook until onion is soft. cool slightly; cut into small squares. cook until zucchini is tender-crisp, about 5 minutes. In a bowl, mix eggs and remaining ingredients except Parmesan and sesame seeds. Let cool for at least 15 minutes; cut into small squares. Instead of the usual chips and salsa, give this a whirl. Cut unpeeled eggplant into 1/2 inch cubes. Core, seed and dice peppers, set aside. cooking, stirring often, until eggplant begins to brown; about 10 more minutes. made ahead you can refrigerate at this point for up to a week. lightly browned. Sprinkle over relish. I am not sure how to word such a "thank you" but, I'll try. Firstly, for anyone who does not read my blog regularly, my father is fighting for his life right now, he was diagnosed with pancreatic cancer last April and has been doing very well up until this point. He is in a hospital in Michigan and I was able to visit him this past weekend for the first time in nearly 3 years. The original prognosis this time was that he had days to live without surgery, slightly longer with. While I was there we talked as much as he was able to, he has a stomach pump running 24/7 at the moment, and discussed many things we had not been able to talk about for a long time. One thing dad told me was the one thing every child longs to hear, he told me that when he read my blog he was "SO proud". I didn't realize he had been reading it and this revelation made me very happy, and sad, all at the same time. So, without further ado, Daddy, this one's for you. I cannot go on without thanking all of my friends, my fellow blogging buddies, my mother-in-law and her co-workers, my mom and her years of cooking lessons-even if she didn't know she was teaching at the time, my beautiful children, and my husband for his constant "you're the best blogger out there". Thanks to all the judges for their extremely hard work, time, and lost sanity! Thanks Jim, for your vision, this was so much fun! PLEASE, go read all the other nominated blogs and the 2 other winners (I sort of count us as a group), they are all so awesome that I had to check 3 times to be sure that I had actually won. A HUGE Congratulations to Paige at Domestic Diva and to Baking Sheet as well! So, What is Couscous Anyway? Yes, this is in answer to the first question posed by my first round of "Ready, Set, Cook!" It seems that when I posted those 3 ingredients, one of them was something not too many people have heard of. I'll admit, I take it for granted that I live in an area where almost anything necessary food-wise is easily obtained, and I also have a teeny tiny edge in the food arena with my diploma but, I didn't think couscous was that obscure, hence the inclusion. What is this couscous of which I speak? Couscous is usually said to be Moroccan but really is used equally in other countries; Algeria, Tunisia, Libya to name a few. Although couscous is a pasta, made from semolina flour like most pastas, it is treated like a grain and cooked nearly identically to rice. The texture is different because the grains are so small and almost every dish I have seen it in is filled with vegetables or meat. It is available in most markets where you would find rice and I have seen it in the ethnic sections as well. We like it as it is made from the box, as a replacement to the usual rice, potatoes or pasta. A couscoussier, also known as Couscous pot, is a traditional steaming vessel used mainly in the making Couscous. Couscous is placed at the top pierced part and the steam from the stew being cooked at the bottom pot rises through and steams the couscous. Stews can be lamb, beef, chicken, and/or vegetables. Here are a few recipes using couscous. Don't be afraid to try it, you won't be disappointed. Broil chicken and cut into bite sized chunks. Set aside. couscous according to package directions. After couscous is cooked add the remaining ingredients and toss well. Place lamb shanks in a single layer in a shallow baking pan. Bake in a 450 degree F oven until well browned (20-25 minutes). Meanwhile, in a 4 quart or larger electric slow cooker, combine onion, cinnamon stick, coriander, ginger, cumin and all spice. Lift lamb from baking pan and place on top of onion mixture; discard fat in pan. Lift lamb to a warm, deep platter and keep warm. Skim and discard fat from cooking liquid; then measure liquid. You need 2 1/4 cups; if necessary, pour off some of the liquid or add enough hot water to make 2 1/4 cups. Return liquid to cooker and increase heat setting to high. Stir in wine and apricots, then couscous. Cover and let stand until liquid has been absorbed (about 10 more minutes.) Spoon couscous around lamb; garnish with mint, if desired. Combine chicken and broth in a large Dutch oven. Simmer until chicken is cooked through,turning occasionally, about 20 minutes. Using tongs remove chicken from cooking liquid: reserve cooking liquid. Skin and bone chicken; cut into bite size pieces. Melt 2 tablespoons of butter with the oil in large heavy Dutch oven over medium-high heat. Add onion,sauté until tender,about 10 minutes. Add tomatoes and next 8 ingredients and stir 30 seconds. Mix in reserved cooking liquid, turnips, carrots, squash, zucchini and garbanzo beans with liquid. Cover and simmer until the vegetables are almost tender about 15 minutes. Uncover and cook until vegetables are tender, about 5 minutes. Add chicken pieces to sauce and cook until heated through, about 3 minutes. Meanwhile bring 2 1/4c. Water and 1- 1/2 T butter and salt to boiling. Stir in ouscous. Remove from heat, cover and let stand 10 minutes; fluff with fork. Arrange couscous in center of serving platter. Drizzle couscous with 3/4 c sauce. Spoon chicken and vegetables atop couscous. Serve, passing remaining sauce separately.